The LG G6 had a chequered life. It celebrated a new aspect ratio display - and was one of the first phones to offer this breakthrough - but launching in early 2017 it was soon swallowed up by newer models, with newer hardware. LG's approach to 2018 is different: avoiding the early rush, the company has launched LG G7 ThinQ with the latest hardware, sweeping aside any worries about it quickly ageing. The G7 ThinQ squares up to its contemporary rivals, looking to fend off the likes of Samsung's Galaxy S9, the rising Huawei P20 and the OnePlus 6. It also feels like LG has found a little more form: it's a great phone from LG and arrives at the right time. It offers good value for money, avoiding the soaring costs of its rivals, while still offering many of the same benefits. But with so many other major rivals already making waves, has LG's on-and-off approach over recent years affected the G7's chance of success? LG plays it safe when it comes to design. 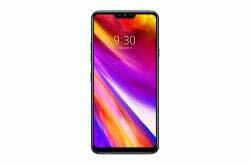 The G7 ThinQ has greater resemblance to the LG G6, with a flatter finish than the slightly more dramatic 2017 LG V30 or updated LG V35 ThinQ. Making a distinction between LG's two leading handsets (V35 and G7) is getting more difficult, as both are big and both offer flagship specs - although for those in the UK, the LG V35 won't be released here, so it's the LG G7 ThinQ that you want. A quality glass finish encases the LG G7 ThinQ, curving smoothly as it meets aluminium edges around to the large 6.1-inch 19.5:9 aspect ratio display. It's Gorilla Glass 5 front and back for added protection, as you'd expect from a current flagship. From a design point of view, however, it's the notch at the top of that display that's likely to be a talkin point. It's 2018, though, and this black-out 'dip' where the top camera is housed feels like a more accepted norm. Just don't call the iPhone X a trendsetter. There are alternatives without the notch, too, including Vivo NEX S, Oppo Find X and Xiaomi Mi Mix 2S. From a build point of view the G7 has an IP68 protection rating against dust and water ingress, and LG also says that it tests its phones to a military drop test standard. This has been the case for some time, but with an all-glass front and all-glass back, this is a phone that you'll have to look after. What we like about this phone is that it remains fairly compact; it's smaller than the Huawei P20 Pro (despite having the same size of display), with the notch effectively knocking out the top bezel (the forehead). There's still some bottom bezel (the chin), but not much. There's a nice symmetry to things when you rotate it into landscape as the notched area is the same width as that bottom bezel. The fingerprint scanner sits on the rear, which we like in a world of under-screen scanners and weaker operational alternatives, as this one works very well. An interesting design detail you'll spot on the G7 is the additional button on the side. This is a Google Assistant button, underlining LG's bigger commitment to presenting this phone as an AI device (yep, artificial intelligence is the 2018 hot word). We've had squeezing from HTC and Google before, Samsung has its Bixby button and now Google Assistant gets a button - in addition to the normal voice and home button long-press options. This button can also take you directly to Google Lens too. The button can't be remapped and you can still long-press on the home button to open Assistant - in reality, if you don't use Google Assistant much, then it's probably unnecessary. Equally, we've found it easy to ignore too if you don't want to use it. In short, the LG G7 is a good-looking phone and there's no lack of quality, although it doesn't quite sizzle like the LG V30 did at launch. We'd also argue that the colour options are a little safe, what with Huawei blasting out with some really impressive colour offerings, thus LG's blue, black and grey doesn't really should as loudly as it could. The specs of the LG G7 ThinQ won't surprise anyone. It sits on the Qualcomm Snapdragon 845 platform with 4GB of RAM and 64GB of storage with microSD expansion possible. Snapdragon 845 is now becoming familiar: it capably powers some versions of the Samsung Galaxy S9, it lifts the Sony Xperia XZ2 and OnePlus 6 to powerhouse status, and it's appearing in lesser known phones, too, like the Vivo NEX S.
As we've experienced with other handsets on Snapdragon 845, the LG G7 flies. It's swift and powerful, every inch the flagship experience - whether that's cutting through emails, managing your social media or ramping PUBG Mobile up to the top settings. There's only a 3000mAh battery in this handset. This is where comparisons to some other devices might help: the Huawei P20 Pro gets a 4000mAh battery, the Samsung Galaxy S9+ has a 3500mAh battery, meaning that the LG G7 battery is a little small for this size of device. In reality that means you can burn through that battery within a day if you're not careful. While it doesn't have the staying power, there is an effective battery saving mode that will ensure your phone sails through long busy days - and you can customise what it affects. Killing the on-screen animation can make things feel a little jerky, but it's effective. There's also USB-C fast-charging for quick top-ups at the plug. Retaining the 3.5mm headphone socket on the LG G7 will be a popular move - especially as there's a Quad DAC (digital-to-analogue converter) onboard. The addition of DTS:X 3D sound for your headphones means great, immersive audio. Certainly the wired headphone experience on the LG G7 is very good. What's really new, however, is what LG is calling the "Boombox". This uses the body of the phone to amplify the volume, with a distinct audio punch coming from the centre back of the phone boosting the speaker output. It works, bringing volume and bass that most single speaker devices can't match. At the same time, it's still only a single speaker arrangement. Turn the volume up and it's not as rich as some of the stereo phones - like the Samsung Galaxy S9, for example - and it misses having that second stereo speaker. LG felt the fallout of the Pixel 2's display disturbance in 2017; while LG the electronics company and LG Display the component supplier shouldn't be immediately bundled together, we get the sense that LG was looking to do something different for the LG G7 and step away from any OLED criticism. The result is a new LCD display which has been called MLCD+ in some corners, but LG is calling FullVision Super Bright Display in the UK. The FullVision part refers to the 19.5:9 aspect - busting bezels top and bottom and incorporating a notch at the top - while the change in technology comes from the addition of a new white sub-pixel, which gives it greater peak brightness. The Super Bright element comes down to the fact this this display will punch out 1000 nits on demand, thanks in part to that additional sub-pixel. We say on demand because this top brightness is provided via a "boost" option you have to manually engage on the brightness slider, should you need it. Outside of that, it will run up to 800 nits in normal auto-brightness mode. The idea is that if you step out into the fierce mid-day sun and need that power from the display to cut through reflections, it's there. It's almost certainly a move to compete with Samsung, which we expect will also ramp up the display brightness in its next-gen devices. There's vibrancy and punch to the LG's screen, with likable overall contrast and colour representation. While OLED has been taking a lot of headlines, good quality LCD displays have the advantage of offering more natural colour fidelity - which is exactly what you get from the G7. The display also supports HDR (high dynamic range to give deeper blacks, whiter whites and everything in between; and which relies on strong peak brightness), so fire up Netflix and you'll get HDR delivery. However, we have to say that it's not as impactful as the big-screen experience of the same programmes. You can also tweak the notch by software. You can hide it, you can flank it with other details, you can change the shape of the corners at the top of the display. LG calls this "new second screen" and we can't profess to understand the thinking behind this name (a bit like 'ThinQ' itself, then) - it's probably a throwback to some of the dual screen models of recent years. While some are dismissing notches, we can't say it makes a huge impact on things. After a few hours of use, you'll barely notice it's even there. With the camera being the area that gets the most attention in smartphones these days, LG is sticking to its distinctive offering - a wide-angle second camera. Like a number of previous models, this second lens will give you a wider field-of-view to fit more into the shot. You'll see this almost nowhere else - not Apple, not Samsung, not Huawei - with only some lesser impact phones like the Asus Zenfone 5 offering such a feature. It gives you a perspective that most other phones can't, which is exciting. Both cameras are 16-megapixels and both offer optical image stabilisation (OIS). LG's play here is to increase the performance and quality of this second lens, but in boosting the sensor, the angle has been reduced slightly to 107 degrees - down from 120 degrees on the V30 and 125 degrees on the G6. The wide-angle camera retains good quality, although it takes a little longer to switch from one to the other than we'd like. Dual cameras offering zoom are rapid to switch and here there's a slight delay. One of LG's other major plays is the "super bright camera" which uses pixel combining for better quality and exposure, so while you get a smaller final image (from 16MP down to 4MP, for example), the colour fidelity of that image is pretty good and you can generally take photos without handshake being a huge problem. Certainly, it can give you a photo where you might just have a dull impression of a photo without. But there's still image noise and detail is downgraded. Attacking the troublesome low-light photo problem (so often they're full of grain and lacking in detail), you can opt to have the low-light mode automatically engage, or you can have it offered when the light drops, giving you a button to press. That's useful, because you have immediate control at your fingertips. While the LG G7 offers HDR it doesn't seem quite as effective as the results you'll get from the the Google Pixel 2, although it will deal with some extremes pretty well. Bright highlights in dark scenes (tricky for all cameras) did seem to confuse the G7 and we've seen some variance in white balance in dull scenes too. Unlike Huawei's P20 Pro offering, AI isn't always on by default - it's something you have to select (conversely it's something you have to dismiss or switch off in the Huawei). You can shoot with the normal camera and the AI stays out of it until you hit the AI Cam button. Here the AI attempts to identify what the picture is, with words appearing on the display suggesting what you might be looking at - sunset, beach, landscape, plant and so on. AI Cam will see sky and think "blue", shifting the colour balance in the photo to give that rich blue sky. In some cases that might be great, giving you a photo that looks better than the scene you we're looking at. Take these shots of London below, looking over the Thames: on the left is the normal shot, which is a little flat and dull, but the water colour is accurate; on the right is AI Cam, the sky is a lot more attractive, but the river is turning green, meaning it's a less accurate representation of the scene. That's really the impression that AI Cam leaves: it gives with one hand and takes away with the other, so you'll be left to decide whether the results are what you want or not. The added vibrancy and pop fits with social sharing trends, but it feels like it needs to be more balanced within the scene - and some of the suggestions are just odd. Pointing at a Range Rover it suggested "poodle" and "cauliflower" (maybe these are the codenames for JLR's next cars...?). Software-produced bokeh (that's the blurred background effect, to mimic pro photo shots) is the another trend, available here on both front and rear cameras. And LG's portrait mode does a decent job of separating foreground and background by using data from both cameras. As such, you can edit the strength of the effect in LG's Gallery post shoot. Like all such systems, however, it will sometimes struggle to identify subject edges - like just beside someone's head or in their hair - and it's here that editing will become useful. In the past five years, Android phones have gone full circle from complete customisation through to Android One - the latter a pure take on Android as found in, for example, HMD Global's Nokia phones. As a manufacturer you have two choices: either a full reworking, or minimal tweaking. Samsung has mastered the full reworking, giving a slick experience full of features that compliment each other. It's so good that app duplication is forgivable. On the other extreme, look at the Nokia 6.1 - it's a mid-range phone with zero bloat, so it's as wonderful in nterface terms as the excellent Google Pixel. Anything in-between now feels a little unnecessary, with LG sitting slap bang in this camp, as it has been for a number of years. We have to ask: why bother? Take the LG Keyboard for example: it's nowhere nearly as good as G Board or SwiftKey (both free), so why bother including it? It just makes the most important form of interaction with the phone worse. On our G7 review device is a folder called "Essentials"; we think it's ironically named as most of it isn't essential, it's duplication - LG's own music player, email, health service, and calendar. The calendar we've taken issue with before because we've never found it to be very clear and Google Calendar is a much better experience. LG's own Gallery app offers a little more excitement though. While we'd generally recommend Google Photos because of the photo backup and AI-based features it offers, within LG's Gallery you get to edit things like the portrait effect from the G7's camera, or create gifs from bursts, which is useful as you get some control in that creation process. Ironically, flip over to Google Photos and it's likely to have created exactly the same gif from that burst without your intervention. But this is Android and you can easily change the apps you don't like, disable or hide things you don't want, change the launcher, keyboard and everything else to get the phone you want. But here's the point - what is LG really adding through its heavy modification of Android? Not a lot. It's safe to say there are a lot of strong contenders for your money in the latest batch of smartphones. Has LG done enough with the G7 ThinQ to stay in the running? Issues aren't particularly prevalent: yes, there's a notch; no, the battery won't last as long as its major rivals; the additional software is superfluous; and the colour and fiinish could be seen as bland. But that's about it. There are plenty of positives: the design is solid, thanks to waterproofing and an interesting new display; the flagship spec means super smooth running; and it's so rare to see a wide-angle camera on a deivce these days, which is great in use. At £599 the price is also more affordable than the top-spec Huawei or Samsung - but both those models have something more to shout about. And with more affordable devices like the OnePlus 6 bringing bags on fanfare, the G7 - perhaps due to the series' peppered history - lacks the same degree of excitement. That's really where the LG G7 struggles: to stand-out, to bring excitement in among a sea of very good flagship devices. That might mean it struggles to get noticed, but it doesn't make it a bad phone by any means. OnePlus has stuck to its aim of bringing you a quality device without the high price and the OnePlus 6 gives you a lot of phone for your money. LG offers waterproofing and a better display, but OnePlus is £100 less, just as powerful, has less software bloat and gives you a better battery life. So which is more important to you? Huawei's P20 and P20 Pro are the devices that everyone is talking about. The P20 Pro is currently the best phone on the market - due in no small part to its amazing camera. But the Huawei P20 Pro is more expensive than the LG G7, leaving the regular P20 as a consideration. It's worthy of consideration - it's cheaper, a little smaller and lacks waterproofing, but has better battery life and a very capable camera. Shock and awe. If you're considering a flagship phone and you don't consider the latest Samsung Galaxy, you're doing it wrong. The looks might not have changed, but those looks are so good - as is the camera performance. Huawei might squeeze in a little more, but the S9+ is one of the slickest and most feature-packed devices on the market. What does the LG offering in answer? It's a lot cheaper and in day to day operation, just as powerful.